One of the most daunting and stressful tasks a Foreign Service Officer abroad can face is supporting a visit by POTUS, the President of the United States. Concerns about security, cultural sensitivities, press coverage and political effectiveness turn such events into an all-encompassing, embassy-wide obsession from the day the idea of the visit is floated until “Wheels Up” when Air Force One departs. There’s plenty of drama, bruised egos, hurry-up-and-wait, and silliness in the planning and implementation of such a visit. The outcome can make or break a career. A mark of a great FSO is the ability to support a presidential visit while maintaining a sense of courtesy and good humor, especially when demands from everyone from the pre-advance team to the press pool verge on the ridiculous. Lloyd Neighbors showed his mettle when he was in charge of press arrangements for President George W. Bush’s October 18-21 visit to Shanghai for the APEC conference in 2001. The Minister Counselor for Public Affairs in Beijing from 2000-2003, Neighbors was interviewed by David Reuther in February 2013. 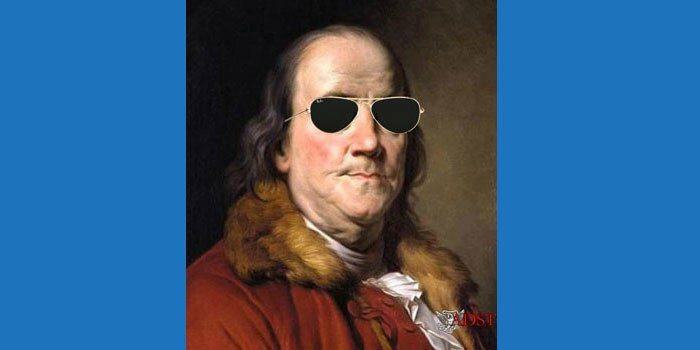 Read about some no-tell CODELs (that’s Congressional delegations) and more No-tell CODELs. Go here to read about how Senator Jesse Helms was convinced that the downing of KAL 007 was a Soviet assassination attempt and about LBJ’s need for a shower head during a visit to Germany. You can also read about the CODEL trip to Grenada shortly after the U.S. invasion. The U.S. President almost attends the annual APEC Leaders Summit. We — the U.S. mission in China — had already in August 2001 begun planning for a bilateral presidential visit to Beijing and attendance at the APEC meeting in Shanghai. But because of the 9/11 attacks, President Bush did not want to be out of the country too long. He decided that he would just come to Shanghai, postponing his Beijing visit for six months till January 2002. Instead of getting rid of POTUS [President of the United States] in one awful swoop, we had to do it twice, which was a boatload of work (laughs). But it was important that Bush did come to APEC, and I think he had a lot of sympathy from the Chinese people because of 9/11. His visit went quite well in Shanghai…. 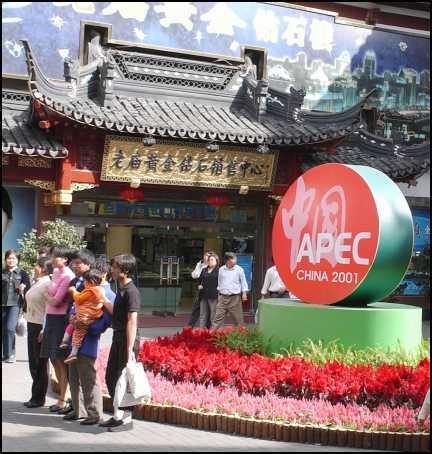 I was control officer for the U.S. mission dealing with the press at the Shanghai APEC. Of course I worked under the direction of the White House press advance, who came to Shanghai about two weeks before the event. But I was the guy responsible for putting the event together from the embassy/consulate side. I had the consulate public affairs team there working for me, and then we brought people down from Beijing and we brought others from Shenyang and Chengdu and Guangzhou and Hong Kong. For any presidential visit, at least when I was around, we always had to bring Francis Lai from Hong Kong. Francis was the best manager I ever met — American or FSN [Foreign Service National] — and I’ve known a lot of outstanding Management Officers. He was a local employee, but he could have run any admin team anywhere in any embassy in the world. He was just brilliant and even-tempered and kind — incredibly well organized. So we would always bring Francis in to help with the admin side, the vast admin side of making a presidential visit work. We also brought officers from other posts around Asia as well. For this type of high-level international conference you have to throw people at the problems. And in those days before sequester and draconian budget cuts we had lots of people to throw into the breach. An APEC summit is enormous — about 25 heads of state and foreign ministers, along with hundreds of deputies and assistant deputies and sherpas and toadies and hangers on. The main APEC meetings took place at a big new convention center in the Pudong area, with a few events reserved for hotels on the periphery. Events at the convention center weren’t too difficult logistically. Once you got the press into the center, it was relatively easy to move them around in small groups or “pools” to cover the separate activities — such as bilateral meetings or press briefings. The hard part about APEC? It’s not just a Heads of State meeting. The foreign ministers come as well. So we not only have to prepare for the White House press corps, we must deal with the Secretary of State’s media groupies as well, who have their own quirks and demands. We have to set up a special filing center for them — anywhere from eight to 14 journalists — as well as for the 135 members of the White House Traveling Press. This involves mind-boggling motor pool movements. We have to transport around the city 150 members of the press, as well as our own officers, press wranglers for each event. Of course, not all 150 members of the press can cover each presidential event. Some of these are small-scale activities that can’t accommodate all the journalists. To handle this problem we create smaller press pools. For example: for the President’s bilateral meeting with the Japanese Foreign Minister, we select three cameramen and their soundmen, two still photographers, and four writers (or “pencils,” as journalist jargon calls them). The pool makes their reports available to all the other traveling White House press. We negotiate agonizingly with the Chinese side about the numbers that can be included in each press pool. We want less press at a particular event. The Chinese want more. We want the cameras to be 50 feet away; the Chinese want them closer — or vice versa. It’s never easy to get so many people to agree on so many details. Fights are frequent, but necessary. With so many moving parts for each event, the details must be worked out in advance. Otherwise the whole thing will fall apart, you will get the blame, and will soon be on your way to Chad, where the job of press spokesman is not career-enhancing. In Shanghai, in addition to handling the APEC events, we also had to help arrange a bilateral press conference between George W. Bush and Chinese President Jiang Zemin. 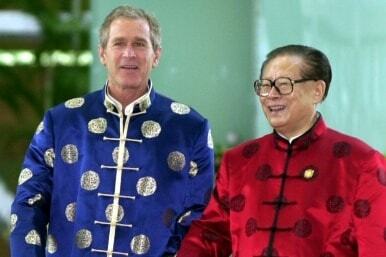 Jiang was leader of the Shanghai faction in Chinese politics, and was delighted to host President Bush on his home turf. We had to organize a press conference for the two principals at an open- air site, just outside the walls of a beautiful Chinese guesthouse. That was difficult enough. Putin proved more of a problem. As a Pacific Basin country, Russia has been an APEC member since 1998. 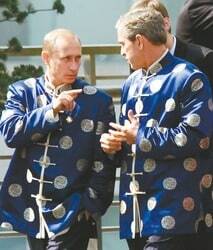 Russian President Vladimir Putin was attending the summit, and we were tasked with doing the logistics for a press conference between Putin and George W. Bush. The first matter of business in preparing for a presidential press conference is to find a good site, one that is convenient for the press but that tells a visual story about where the event is taking place. The White House Advance is very particular about the choice of venues. We looked at a lot of different sites, looked at, for instance, the Grand Ballroom in the Peace Hotel on the Bund — the fabled Shanghai waterfront. 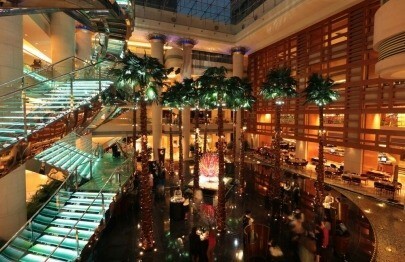 It’s a beautiful old art deco building, very nice. It was a little shabbier in those days than it is now, but still an elegant place. So we thought about having it there. The ballroom on the top floor would have been a wonderful site, a place still echoing with the sound of 1930s jazz, the voice of Noel Coward — who wrote Private Lives while ensconced at the Peace — and the ghosts of merry dancers long gone. But there are only two tiny elevators that go up to the twelfth floor. And you have 300 journalists who are going to want to come to this event — plus a myriad of security people and all the hangers – on. From a security standpoint this would not work. We just couldn’t get the people up and down the building. So we looked some more. Finally, the White House decided that the best place to have the event was at the Portman Hotel, where the President would be staying. The Portman (pictured) had a huge, beautiful atrium with plenty of room for crowds and convenient for the president to come down from his hotel suite for the press conference. This was with just 24 hours’ notice. So the studio builds this set that looks like a Chinese imperial palace. And they bring it in to the Portman at 4:00 in the morning, driving this huge truck with all the set materials into a highly secure area, through a cordon of guards and fences around the president’s hotel. Trying to get this shipment at 4:00 in the morning through security was just a filthy task. But we did it, and it looked like an imperial palace in the Land of Oz (laughs). It was an imposing structure, vermillion walls with gold trim. It did look like we were in China, a China of the Boxer Rebellion days, perhaps. At any rate, the set does work and the two presidents give their press conference for 20 minutes, maybe 30 at most. And the set cost us $13,000 to build. But that’s chicken feed compared to what is spent on a presidential visit. 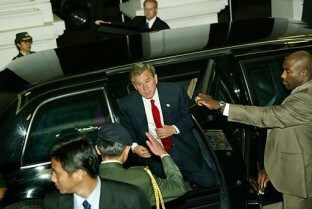 Six months later President Bush visited Beijing, Seoul, and Tokyo. From what I heard, the cost of that visit to the three countries for about one week was $50 million. I suppose if the President had an accident, we would fly the helicopter to pick him up without Chinese approval. The flights also bring in office supplies and computers. Over 100 security personnel also show up at each site. And the White House Communication Agency, WHCA, brings in all of its gear and installs another 600 telephone lines in the hotel. And they bring in many of the motorcade vehicles as well. Mind-boggling. During these visits I spent a lot of time cooling my heels, sitting around with the press and the White House security team. I learned some interesting details about the motorcade. The president’s Lincoln weighs as much as an 18-wheeler, semi-trailer truck. It can resist an attack by an RPG [rocket-propelled grenade], an anti-tank missile. It has its own oxygen system. The motorcade also has another vehicle that serves to defend against chemical or gas attacks. The agents who drive this SUV wear their anti-gas suits all the time the president is moving. And if you notice their complexion, they have this sort of gray pallor from breathing in carbon filter materials all the time. In case there’s a chemical attack, they will be protected. 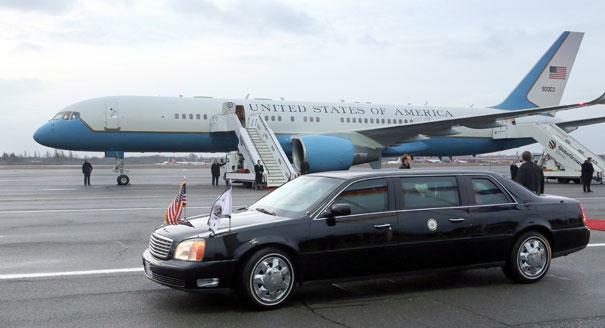 And the President’s car has its own oxygen system that can go into effect to protect him. The motorcade has another vehicle, known as Linebacker, which is a big SUV, an enormous one. It’s full of scary guys with guns. And it drives slightly out of line from the rest of the motorcade. 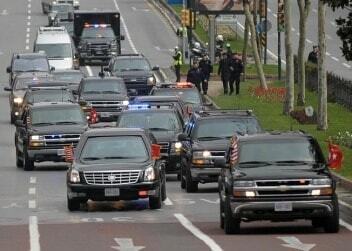 If you see a motorcade going along, the cars will all be in a straight line. Only Linebacker is a little bit off to the side. If it sees any car threatening the motorcade, its job is to knock ‘em off the road (laughs). One of the security agents told me that if you’re riding along in the motorcade and you hear through the walkie-talkie the phrase “Sanitize,” you better duck — because the agents will be sanitizing the area around the president’s car — with bullets. It’s fun to learn all this arcana about how a presidential visit works. It’s not always fun to deal with the electric tension that surrounds these visits. At some point during every presidential visit, I reach a state of complete despair. This event cannot possibly work. It’s going to go crazy and I’m going to be a fool and I’ll wind up pumping gas in Shreveport, Louisiana. But it doesn’t work that way. The presidential apparatus rolls on, right over you, even if you make a mistake, and before too long it’s over and everyone can breathe normally again…. My most important duty during the APEC visit — and in the visit to Beijing four months later — was to ride in the motorcade press van. This is how it worked. Whenever the president had an event, a press pool would tag along in the motorcade. For each event the White House would choose some 10 to 14 of the traveling press chosen to ride in the motorcade with the president. Journalists morbidly refer to this as “The Death Watch,” because when President Kennedy was assassinated, there weren’t photographers/cameramen to record the event. After that, radio and TV and print media decided that any time a President goes anywhere; they need journalists along with the motorcade, just in case something unexpected happens. I got to ride in the motorcade and brief the journalists on the next event and on the situation in China in general. I enjoyed the experience, though it was not without emotional highs and lows. We had a huge kerfuffle between White House security and the White House press advance and Chinese security over what the traveling press would do when the motorcade arrived at a site. In particular, the Chinese were concerned about press behavior at the site slated for the joint press conference with Presidents Jiang Zemin and George W. Bush. And the White House was just as adamant, insisting, “This is the way we always do it. The motorcade press pool has to be able to cover the first event. It’s not right to exclude them. They must be there. We’re going to get out of the van and quickly make our way to the front. We’ll make it in time and we won’t cause a problem.” We argued back and forth. In the end, the press pool did leap out and race up to the front and it looked tacky. And the Chinese say, “President Jiang Zemin does not want this to happen. What other higher authority would you like us to go to?” In the event the motorcade pool press did jump out of the van, but they did not race to the front nor did they cover the handshake. Another pool, stationed in advance, got that shot, and it worked okay. The motorcade pool did, however, get to cover the rest of the event in a much more orderly fashion. That’s why the cameramen are always pushing and shoving their way to the front, armed with badges and three cameras and various lenses and even portable step ladders so they can shoot over heads if need be…. I also had run-ins with the White House press advance team, who could be extremely demanding and difficult, unreasonably so at times. I particularly remember one press advance officer, a woman — skilled at her job, with years of experience. But she was prickly as a hedgehog. And she was just going around all the time in every circumstance talking about the F…ing Chinese this and the F…-ing Chinese that, and just going on, and in places where the Chinese could easily hear her. Her boss apologized to me later on. She didn’t apologize, but she did change her tune. After that we had a good, professional relationship. She came to Beijing as well and she screamed and yelled as usual, but she knew how to make things work and so we got along. But sometimes you have to tell the White House when they’re doing something stupid.